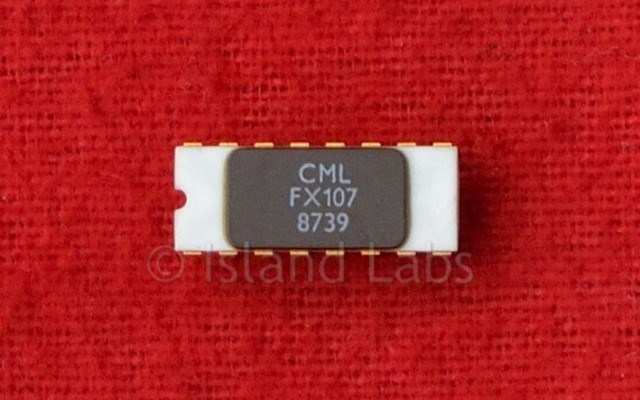 The FX-107, FX-207 and FX-307 are a powerful and flexible family of high performance monolithic signalling devices, based on 3-tone Sequential Code signalling techniques. Constructed using MOS/LSI technology, the devices perform all frequency discrimination, tone generation and code timing functions on-chip, using simple external RC networks. 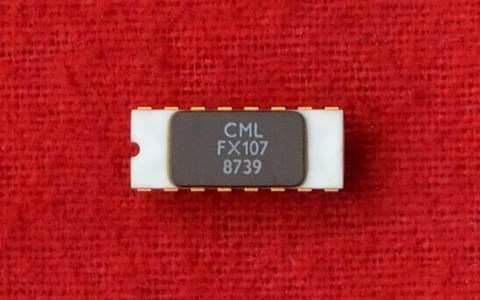 The family members are FX-107, a single code transceiver with transponder capability; FX-207, a multi-code transmitter with logic controlled selection of any one-from-eight codes; and FX-307, a multi-code receiver which decodes 8 different input codes and provides an appropriate binary coded output. Transmitter devices generate the programmed Group Code on receipt of a logic instruction; Receivers decode Group Codes applied to their signal input and operate integral output switches when the programmed code/s are received. Used separately, or in any required combination, these exciting new devices combine high performance with economy and simplicity of use; they offer a new state-of-the-art approach to applications involving selective signalling between two or more points, using a common transmission line or radio link. Virtually any number of outstations can be hooked into the common line and a variety of instructions signalled to each one selectively. Automatic answer-back, automatic station scanning and station status check functions are very easily implemented, and cost barriers previously associated with complex functions of this type are dramatically reduced. Extensive applications exist for the '07 series in Telecommunications, Control Signalling, Instrumentation, Automation, Process Control and similar fields. Typical examples include selective control switching, remote alarm signalling, data transmission, selective telemetry, status transponding, selective paging, intercom systems, vehicle paging and identification, security systems and numerous similar areas. Designed for maximum compatibility, the devices employ identical frequency discrimination and code timing circuits and operate on a standard 3-Tone Sequential Code principle. Each code consists of three tones, each of different consecutive frequency and sent in a pre-determined sequence (Group Code). The operating frequencies and channel bandwidth capabilities of the '07 family are such that upwards of hundreds of thousands of unique Group Codes are available to the user. Another particularly important feature is the extreme simplicity of setting-up and calibrating the code frequencies. All devices are housed in 16 lead ceramic dual-in-line packages and operate from a single wide tolerance D.C. Supply. Used separately, or in any required combination, these exciting new devices combine high performance with economy and simplicity of use; they offer a new state of the art approach to applications involving selective signalling between two or more points, using a common transmission line or radio link. To ensure correct recognition by a receiver, transmitter devices (107/207) must send a minimum of ten cycles of each tone in the Group Code. This is an absolute design limit and assumes accurate period timing; to allow for component and other tolerances, the recommended minimum is twelve cycles of each tone. In a multi-station system it is usually convenient if all stations have common values for timing components; in this case, the lowest tone frequency used in the system should be adopted as the basis for all timing calculations. Apart from this, any preferred tone length may be used. A transmitter tone period is controlled by a single CR network (Rt & Ct of Figs 6 & 7); this determines the period of an internal timing stage. Note that Tp is the transmission period for one tone; the overall time for transmission of a Group Code is, therefore, 3Tp, there being no interval between successive tone steps. Where 0.63 is a design constant and subject to production tolerances of 0.6 to 0.7; R = MΩ, C = µF, Tp = seconds. Recommended minimum component values: R = 100kΩ and C = 1nF. The tone sequence decoding circuits of the 107/307 receivers include a timing gate. This gate period is triggered (or re-triggered) as each programmed tone is received and sets the maximum time allowed for receipt of the next consecutive tone in the Group Code. If one (or two) tones in the group have been detected, but the second (or third) tone is not received within this gate period, the decode system clears down and reverts to first tone search again (FX-107) or adopts an "idling" position (FX-307). This gate period is controlled by a single CR network (Rs & Cs of Figs 6 & 10) which determines the period of an internal retriggerable monostable stage. Gp should always be slightly longer than Tp, and to allow for component tolerances throughout the system should be calculated to equal 2Tp, but longer periods may be used if preferred. Where 0.63 is a design constant and subject to production tolerances of 0.6 to 0.7; R = MΩ, C = µF, Gp = seconds. Recommended minimum component values: R = 100kΩ C = 1nF. The interval between the last tone of one Group Code and the first tone of the next should not be less than period Op; this ensures that all receiver tone gates have cleared down when the new code transmission commences and avoids alias code switching. To allow for Gp (Gate Period) component tolerances, particularly with multi-station systems, the general basis Qp >1.5Gp is recommended. Where 0.7 is a design constant and subject to production tolerances of 0.65 to 0.75; R = MΩ, C = µF, Qp or Td = seconds. Recommended minimum component values R = 100kΩ, C = 1nF. The tone recognition system employed by the FX-107/307 receivers is based on a period sampling technique. Input signals are amplified and shaped to provide clock signals to the bistable flip-flop, the output of which is a square wave having a period equal to the interval between successive input wave-form 'zero-crossings' (see Figs 6 & 10). The flip-flop output triggers a dual monostable, which generates reference periods corresponding to 1/f'a and 1/f'b where f'a and f'b represent the tone accept channel edges, i.e. bandwidth. These periods are determined by RA/RB/RC, C1 & C2 and the D.C. reference levels applied to the monostable via Rk1,2,3. The reference periods are compared against the signal input period in a comparator, the output of which controls a particular counter/storage system. This counting system discriminates against random spurious information and delivers an output only when a right in-band tone signal is received. Gating circuits are incorporated which prevent false operation when harmonics of the tone frequency are applied. This tone recognition system yields extremely sharp tone channel definition, coupled with fast response time and high immunity to false turn-on due to out-band noise, regardless of the noise frequency and amplitude. The period sampling system requires, however, a 'regular' input waveform for correct operation. Input noise can, if mixed with the required in-band tone, prevent the circuit from recognising that the tone is present. This effect is produced because the noise 'jitters' the interval between successive signal zero-crossings and the comparator/counter rejects the information as not being consistent with an input signal having a frequency actively within the tone channel limits. If the noise is random in nature, e.g. spurious noise spikes, or short term interference, it has little effect other than possibly to increase the overall tone recognition time by a few cycles. If the noise is continuous, e.g. parallel in-band, and out-band tones are on the signal line simultaneously, the device does not recognise the in-band tone. If the noise is semi-continuous, e.g. speech signals, increasing the in-band tone duration allow the tone to be recognised during a momentary 'noise' pause. The device is therefore ideal for use when in-band tones (Group Codes) are transmitted sequentially, but operation in parallel-tone signalling schemes is not recommended unless adequate pre-filtering is used. All the devices incorporate a signal input amplifier offering a high input impedance. The amplifier is designed using negative feedback principles, and therefore the input is D.C. self-biased. Signals to the input pin should normally be A.C. coupled to avoid disturbing this bias point. High-level pulse signals (> -6V) may be directly coupled. The actual shape of the signal waveform is not important and may be sine, square or pulse. Input impedance is typically 50kΩ at mid-range supply voltages. This value varies with supply voltage and production tolerances, and a total spread of 25kΩ to 200kΩ should be assumed. Fig. 2 shows the production spread of input sensitivity versus supply voltage.